Watch out for the RCMP speed trap in Canmore , Alberta as you leave Banff park.. it generates the RCMP millions and millions of dollars per year. Police do love to lie and say that all accidents are mostly speed related, to justify their fat cow cash grabs, especially in Alberta and in Ontario now too.. they lump all of their homemade statistics as the accidents, deaths related all to speeding.. but not in reality to drunk driver, bad drivers, road rage, poor roads, bad snow cleaning.. This is also still simply not acceptable. There is a direct link between DRIVING and collisions. The MORE you drive, the more likely you are to be involved in a collision and the more likely you are to get seriously hurt . So the police will now give tickets to all drivers . Now if the cops are here just to collect speeding tickets and not to catch the real bad guys than merely do get rid of them.. speeding is not the main factor in accidents firstly.. but impaired, drunk drivers, road rage are.. The police can get promoted for getting more cash, giving out more tickets too.. self serving or really serving the public interest? AND WHERE DO IN REALTY THE POLICE OFFICERS GET ALL OF THEIR COMMON SENSE STATISTICS? SUPPORTED BY THE FIGMENTS OF ONE’S IMAGINATION AND THE NEED TO JUSTIFY THEIR JOBS.. CAN I SEE THEIR DETAIL SUPPORT STATISTICS, POLICE TRAFFIC TICKETS REPORTS IN PRINT? NO? AND WHY NOT? “As Alberta grows, drivers are causing more problems, he said: “A lot of people are impatient, there’s road rage like never before, an increase of vehicles on our roadways, With booming populations, there’s an increase in collisions.” wow those are very smart observations, even such as traffic tickets are good cash cows too, and what all the people who speed are guilty of road rage? or is there a separate ticket being issued to road ragers? just as there is to drunk drivers? Anyone who thinks the cops here are being honest, serving the public is a fool..
and yet here is what I find surprising, neither the insurance companies, the provincial government, nor the federal government, the police have real, valid detailed statistics on the causes of traffic accidents: such as how many were caused my alcoholic drivers, how many were caused by speeding, how many were caused by poor road conditions, lousy snow clearing as well, etc not even in Ontario, Alberta, Quebec, BC as well.. …. so what do the insurance companies do with all the extra money they collect, certainly they of all persons should have firstly the best statistics on traffic accidents now in the first place, or how do they determine their rates??? Even Canada’s police chiefs have to rely on accident statistics from other countries, such as Australia, Great Britain, the US..
And while car death rates have fallen, the ubiquitous use of cell phones and BlackBerrys while driving pose a serious danger to drivers. The RCMP like to give speed tickets when you are leaving the park, not entering it too.. and I got 2 speeding tickets on the same spot in Canmore ten years apart too… and the second time I went to court and rightfully fought the dirty RCMP too. It’s all very simple: obey the laws. You broke the law, accept the consequences, and if that hypocritical, absurd, extreme statement was the reality, the truth, everyone would next be in jail, all of the politicians, civil and public servants, cops firstly.. Most reasonable and reasoning people have seen the folly of speed cameras for decades now too. In reality the too often self serving, money hungry, promotional and empire oriented police, and their superiors, bad justice ministers, bad politicians really do not care about the citizens good welfare but only their own. The police TRAFFIC program brings in hundreds of thousands of dollars but the police, city runs the program as revenue neutral. Profits are put back into more supposedly good traffic safety initiatives, but mainly into the police empire building, so it really IS NOT THE CITIZENS GOOD WELFARE THEY FIRSTLY DO ALL CARE ABOUT. And No matter how that dirty RCMP weasel spins the facts, tries to weasel out of the truth, the RCMP was clearly wrong on many counts in the Taser death of a polish immigrant at the Vancouver airport.. they were uncompassionate, inconsiderate, used more restraining force than was necessary, and they next also clearly lied to cover-up their own immoral acts, and many times as well, They slander a good man in the process as well.. and so none of this was, is acceptable or forgivable.. none of it. Remember that one of the first RCMP outpost in Canada historcially was in Calgary, Alberta the major home of crooks, thieves, cattle rustlers. 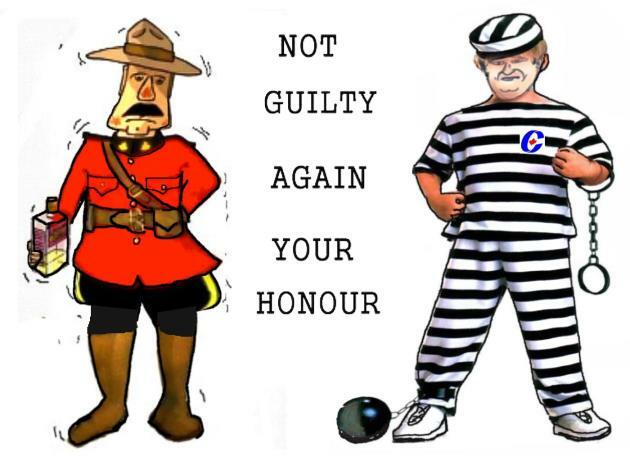 Now it is the home of not just the abusers, drug pushers, car thieves, white collar criminals but the bad RCMP as well.